Lots of people have requested a printable flyer advertising the sale. It’s here! Please consider printing a few of these out and hanging them up around your office, church, or local business. The file should be small enough to share comfortably via email, too. Click this link to download the flyer. The last bit of happy news for today is that our list of business sponsors is growing! The owners and employees of many of these businesses will be baking and volunteering for the sale alongside home bakers, and a growing team of food bloggers, making this a true community effort. Please join us next Saturday in support of our neighbors up north. Special thanks to volunteers Rachelle and Catherine for sending out our press release. 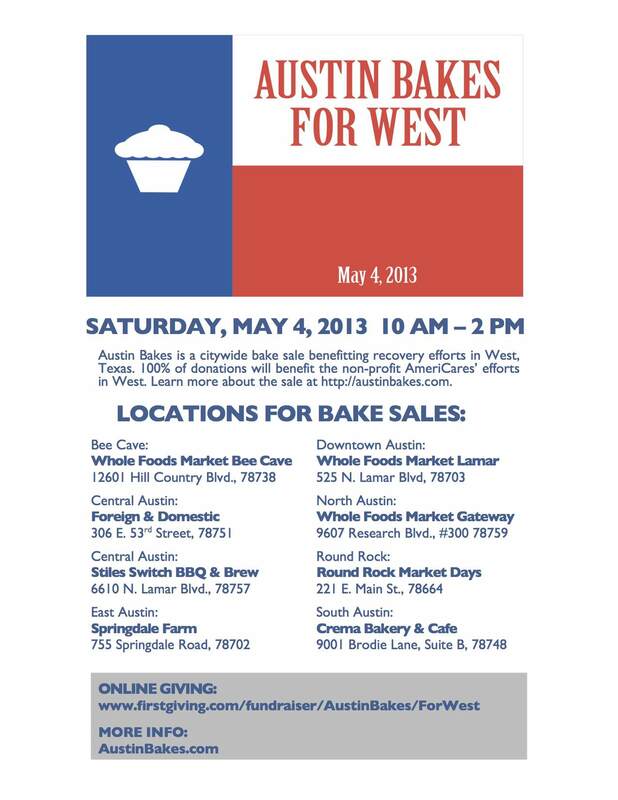 This entry was posted in Austin Bakes for West, Blog, News about the sale, Past Sales and tagged Austin Texas, bakesale by Kathryn. Bookmark the permalink.